Liquid cooled cast-in heaters are the most common heater design used on plastics extrusion barrels. The liquid cooling tubes run symmetrical to the heater element, which provides a uniform cooling pattern across the body of the casting. This cooling function dissipates heat rapidly from the barrel allowing a tight control of the melt temperature during operation. 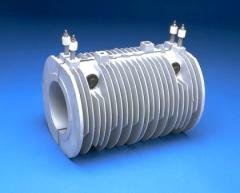 The typical liquid cooled design features a single ½” diameter cooling tube of stainless steel or nickel alloy. The tubes can be supplied with no termination and plumbed at the location of the equipment, or other termination options such as cast-in threaded fittings can be supplied to minimize installation time. This design is also available with a dual cooling function. Although slightly larger in thickness, this design allows for a second cooling tube assembly, which can be employed, if the initial cooling line fails due to scale build up or cracking due to corrosion. All Durex cast-in barrel heaters are available with mounting options of stainless steel locking straps or bolt-on clamping construction. 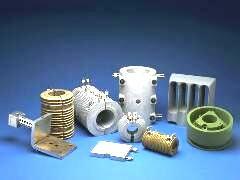 Various electrical termination options are available depending on the application or environmental requirements. Finned air-cooled designs provide effective heating and cooling for plastics extrusion barrels. The fin pattern can be supplied as a standard height of 1” or manufactured to a low profile thickness for small extruders or applications requiring rapid cooling. This pattern is designed to allow the optimal airflow around the casting for maximum cooling rates. Typically the forced air for the cooling function is driven by a shroud and blower system that is an integral part of the extruder, however these heaters can be utilized with an individual shroud and blower assembly for increased cooling control of the individual heater zones. All Durex cast-in barrel heater designs are available with mounting options of stainless steel locking straps or bolt-on clamping construction. Various electrical termination options are available depending on the application and environmental requirements. Although not a common design, heat only barrel heaters are available primarily with the stainless steel mounting strap option. This design is standardly 1” thick and can be used with all standard electrical terminations that Durex offers. The heat only design can be used on piping areas that are typically more difficult to heat such as elbows and joint areas. 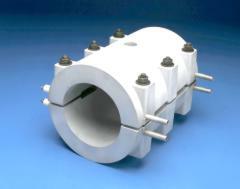 The heater can also be cast directly onto pipe elbows or other areas to produce an integral heated part in specific applications such as feed pipes or heat exchangers. Designs are available in both aluminum and bronze alloys. The Hollow Cast® nozzle heater design was developed by Durex to provide a maximum efficiency-heating device for plastic molders. Utilizing casting technology, a high performance mineral insulated heater is cast in a bronze alloy and machined for a precision fit onto the injection nozzle. The heater is internally profiled along the length of the casting for optimal heat distribution under working conditions. Combined with the exceptional heat transfer qualities of the bronze alloy, this heater design offers superior performance over conventional nozzle or sprue bushing heaters. The Hollow Cast® heaters are available with leadwire terminations that include Teflon® and high temperature fiberglass with stainless steel overbraid or flexible armor cable. The “L” shape cast-in heater design is typically used on square and rectangular extruder barrels, which utilize a twin, screw design. In most cases, the high operating temperatures in these applications require these heaters to be constructed of a bronze alloy, however aluminum alloys are used for applications, which do not require the higher watt densities. 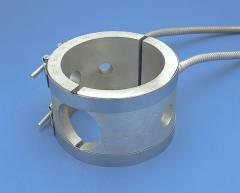 While the most common design for “L” shaped heaters consists of heat only, they can be manufactured with cast-in cooling tubes for Typical mounting options include manufacturing the casting with 45°mounting flange which allows the heaters to be bolted and drawn together on the barrel or the heater can be supplied with mounting holes machined into the casting to mount directly to the barrel. The most common electrical termination for the “L” shape designs is a junction box mounted on to a vented tower that extends from the body of the casting. 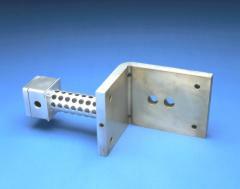 The box has a gasket for moisture resistance and can also be supplied with explosion proof specifications. The junction box can also be cast directly onto the heater. High temperature leadwire with a heavy-duty bronze braid is also available upon request. Cast-in cooling jackets are manufactured for specific applications that do not require heat, but require a uniform cooling source, which can be controlled. The cooling jacket typically is 1” thick with ½” cooling tubes that are either stainless steel or Incoloy depending on the application. 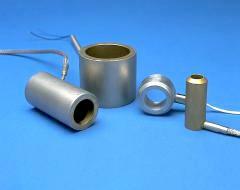 As with other liquid cooled designs, all standard cooling tube terminations are available.